Succulent sedums require little water & are pollinator favorites for food. 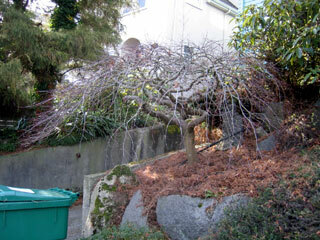 Wondering how to prune Japanese maple trees? One of my favorite garden maintenance chores is pruning dwarf Japanese Maples. I enjoy it so much that I’m considering rewriting the prior sentence so it doesn’t read “chore”. To me, working on one of these trees is like working on a sculpture. When I begin, they tend to be tangles messes of ratty old leaves, dead old branches and hacked tips from inexperienced pruners. When I finish my spa treatment, they are spectacular twisting forms through which light and air and birds travel freely. After I lift their skirts, passersby no longer grumble about wayward branches. And with a lightened hemline, the beautiful legs and twisting forms are revealed. Later, in spring, when buds open and delicate lacy leaves adorn the branches, breezes will flow easily through this bonsai form. Leaves will flutter adding movement and interest in the garden. Birds will fly through branches. And, when autumn arrives and the trees colorful leaves abscise from branches, they will be more inclined to fall to the floor below the tree rather than tangling in masses of accumulated dead branches. Once on the floor, these delicate leaves form a protective duff-like layer of organic material, which helps protect the tree’s roots in winter, adds nutrients to the soil, and deters weeds. And, when the tree is bare the following winter, it should require minimal pruning to maintain its fantastic new look. When I approach a Japanese Maple, I follow a few basic rules of thumb. First, I take out the dead material — leaves, dead branches, stump cuts. Second, I repair bad cuts made in the past, and believe me, they’re always there. An especially consistent error I correct is shearing cuts. Many will try to “shape” their trees to the edge of a path and ruin branches in the process. Understanding how and where to make a cut is critical to these, and any other, tree or woody shrub. Third, I consider crossing and rubbing branches, and I remove some of these. 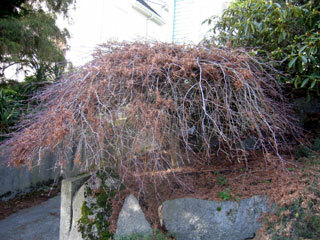 (Dwarf Japanese Maples sort of break the crossing & rubbing rules sometimes as part of their beauty lies in their twisty, fused-branch form.) By now, I usually have very little left to take off the tree. I may take out a few limbs that drag the ground or stick out in pathways. But, I keep my work minimal. I am often stepping away from the tree, admiring its form and considering the consequences of each potential cut. If I remove too much, I can damage the tree significantly. If I remove the wrong branch, I can’t reattach it. So, I work slowly and with care, making circles under and through the tree as I methodically make my way toward a finished tree. Need help with your Japanese Maple? Please get in touch to schedule a garden coaching session to learn the in’s and out’s of pruning your own tree. Or, get in touch to request an appointment to have me clean your tree for you. Sometimes getting a neglected tree back into shape and then having a coaching session to learn to care for it going forward works best. Everyone is unique — just like their trees! Hey, you inspired me to get out there and at least take 3+ yr.s of deadwood off of one of my dwarf J. maples today! I wish I could swing it to get your expert coaching on “real” pruning, not in the budget at the moment but maybe someday. Sorry to miss you on Saturday but I’m sure the meeting will have the heck blogged out of it by the participants and we’ll hope to catch you next time (maybe not on a Saturday)! I have a lacey leaf Japanese maple tree/bush some 43 years old that needs shaping. Curious where you are located? Would luv to see some of your work. Depending on cost get you out here and get a game plan.